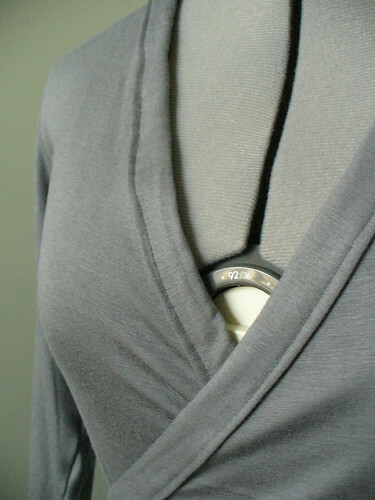 Hope is a simple wrap dress pattern for knit fabrics with some stretch. 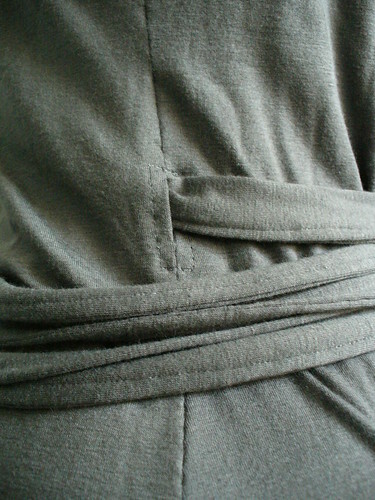 The dress uses binding around the unfinished edges which extends to form the ties. This dress is a quick make with only 3 pattern pieces! Make it your own! great job! I would like to make one too! Great pattern, I need to work on adapting the sizing a bit better for me, but my first attempt is still wearable so I’m happy! Thanks so much for posting this! I’ve been looking for a pattern exactly like this…can’t wait to make it! Dear Liz, the dress is really, really nice. I was wondering what stich did you use to sew this thin jersey? I plan on buying a new sewing machine soon and would like to have some good stiches for stretch fabric. What is your experience on the subject? I must make at least a couple of these, gorgeous, thanks so much for offering up the pattern and instructions that’s so kind of you, I know how time consuming tutorials can be! Perfect! I’ve been looking for something like this. Thanks for linking on burdastyle to your blog. I couldn’t get it to download from burdastyle for some reason? Hello, After cruising so many websites today, non regarding sewing, I found your site through Patternreview. First of all, I’m not a spammer but a 76 year old, former Buckeye living in “Hotlanta” now, boo hiss. I’ve been working on a wrap dress and liked your thoughts on this dress which you reviewed. In that you mentioned that you still don’t have a serger. Years ago when I lived in Boca Raton, Fl. I bought a Bernetta serger which caused me unimaginable problems when threading the lower looper…it literally took hours! Last year I bought the Brother serger which has the easiest lower looper you can get for the low price of about $200. I paid a lot more for the Bernina model and it’s sure a whole lot less than one of those $2000 models which use jet air threading. The investment isn’t much and I thought you might like to give one a try. Shop around, look at Overstock where they sometimes offer free shipping and no state taxes. I buy many things off-line, recently purchased all the appliances on-line. (Stainless steel Samsung French door fridge too) No problem, free delivery and no taxes. Oh, yes, why I wrote! Check out the Wal-mart website. 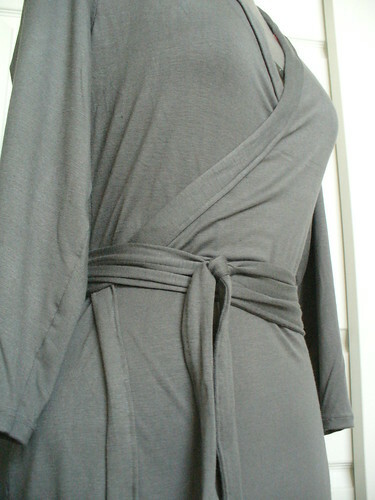 They carry a Norma Kamali wrap dress, not available in stores at $14/16. It’s made of a wonderfully heavy stretch fabric, best fabric I’ve found in that. I’ve made a pattern from the dress so that I can have different colors other than black or polka dot. This dress is a keeper with a wrap that won’t open because there’s a complete front under it. Confused yet? I love this! I’ve been looking for wrap dress patterns forever, and this is the first one I absolutely love. Going to get some fabric tomorrow! Thank you so much for the pattern! I’m currently halfway through my first pregnancy, and have been thinking that I needed a wrap dress of some sort to get me through the summer, but something that would still be flattering after pregnancy as well. And when I stumbled across your pattern, I knew I had hit gold. Thank you so much for this – and for you amazing little site. I love it, and full of awesome ideas!! Just made this dress. Can’t wait to wear it to work! Really great pattern, and easy directions to follow. Thanks! The one thing I had to adjust was the sleeve and arm hole width. I’m a pretty thin person, and the sleeves (as I cut them from the pattern) were too tight for me around the armpits. Might be personal preference. But I might suggest testing the pattern against a favorite long-sleeve tee of yours to make sure the sleeves are right for you. That’s all. I really really appreciate your pattern, and hope to find more in the future! Im sure the dress is fabulous, but I’m sorry, look at this woman. She has a stunning figure. There is no way I can make this dress look that good, sewing it nor wearing it. Well, thank you so much! What a compliment! I just made the pattern for myself and decided to share it for whoever is either the same size or knows how to grade patterns. I wish i could grade, but maybe someday I’ll learn. If you know how this is actually a fantastically easy dress to make, and if you’re worried about hiding figure “flaws”, you could use an interlock knit which tends to be much better for that and even easier to sew with. Quite a few people have made this, some different sizes as well. You can check burdastyle.com and just search for this dress to see what people have done. I’m probably being a total idiot, but how do I put the pattern together? Do I stick the A4 Sheets together? This dress looks great on you because you have a beautiful figure. The size of this dress seams perfect for me, too…I am looking forward to trying this pattern. Thank you for sharing. Finished my dress today. Can’t want to wear it. The opening is only on the left side correct? It’s nice dress with nice figure. This pattern says something. Look at that and realizes what beautiful thing is in it. Thank you for sharing this! So generous! I found a great 60’s style tissue for it. With the cooler weather approaching here I have been looking for a new perfect dress and now I have found it! Gorgeous, simple and elegant I know this will be great to dress up and dress down. Thanks for the links. Cheers, Sasha. I absolutely love this pattern! It is exactly what I have been searching for and was delighted when I happened upon it. I am new to pinterest and am not sure how to get this pattern. Is it emailed to me? Is there a link I click on ty o down load it? Any information you can provie would be most helpful. Thank you for providing such a beautiful pattern. could you post a small drawing of how the 3 pattern pieces are supposed to look like when put together? I’m really not getting it… 😦 thx! I’ve been looking high and low to find an actual Wrap dress! Thank You!